Suwa Grand Shrine Kamisya Honmiya (諏訪大社 上社本宮) is the head of all Suwa Shrines. Suwa Grand Shrine consists of four Shrines which surround Lake Suwa. Kamisya Honmiya is one of them located in south side of Lake Suwa. It is one of the oldest Shrines in Japan which appears in "Kojiki," the Japanese myth. Current shrine was built in 1849. 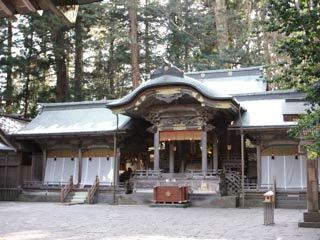 In old time, it was entitled "Myojin Taisya," the highest priority of all Shrines. It was highly respected by Samurai and Shogun as the god of warrior. The oldest building remains in this shrine is the gate which built by Tokugawa Ieyasu in 1608. 2. use bus to Suwadaisya Kamisyahonmiya. Enshrined God: Takeminakata no Kami. Established: over1,600 to 2,000 years ago. Class: Myojin Taisya, and the head of Suwa Shrine which has about 25,000 brunch shrines in Japan. There is no exact record when Suwa Shrine was established, but it appears in "Kojiki," the oldest Japanese record. Therefore, Suwa Shrine exists at least over 1,600 years. It is one of the oldest shrine in Japan. Suwa Shrine is called "O-Suwa-sama," or "Suwa Daimyojin" and fully respected from all over Japan for thousands of years. Suwa Shrine has the many aspects, such as the god of water and wind which protect natural disasters, the god of farming, the god of safe traveling, the god of business and the god of warrior. As the god of warrior, Suwa Shrine was considered as the strongest god, and many of Samurai, Shogun and all other Daimyo worshiped this shrine. The first "Seii Taishogun," simply known as "Shogun" Sakanoue no Tamuramaro worshiped Suwa Shrine and prayed for his victory at Suwa Shrine. Since then many Shoguns such as Minamoto no Yoritomo and Tokugawa Ieyasu contributed many buildings and treasures. Takeda Shingen, the feudal lord of Kai in Sengoku Period, highly respected Suwa Shrine. He not only contributed many buildings, but also re-organaized most of important Matsuri and ritual ceremonies. It takes Sacred Mountain, Shintaisan, instead of sacred tree, goshinboku. Shikinenzouei Mihashira Taisai, a.k.a. "Onbashirasai" is the most famous and important Matsuri for Suwa Shrine. It happens every 6 years. It is chosen as one of three major unique Matsuri in Japan. All four Suwa Grand Shrines are surrounded by four sacred masts, called "Onbashira." 16 of the sacred masts are cut at the mountain and pulled to all those shrines. The biggest events is dropping the masts from the mountain. When the mast is sliding a slope, people try to ride it out to receive the power of god. It is very exciting to see and many people join this Matsuri for seeing this event. The origin of this Matsuri is very old, but it became major Matsuri when Emperor Kanmu made it as the Matsuri of Shinano. Then, Takeda Shingen sponsored this Matsuri and planed many events for this Matsuri. It happens from April to May. It is typical Suwa Style. Suwa Style has two wings which are used for ritual ceremony and the pray-shrine for worshipping. There is no main shrine behind the pray-shrine. It was used to be a gorgeous shrine, but in 1582, it was burned down by Oda Nobunaga. After the destruction of Suwa Shrine and Takeda Clan, Nobunaga hardly chewed out Akechi Mitsuhide at the victorious party. Two months later, Nobunaga was killed by Akechi Mitsuhide. Current Shrine was built in 1838 by Tatekawa Tomiaki. ... was built in 1827. It is the largest building in Kamisya Honmiya. The huge drums in this Kaguraden are also made in Edo Period. Today, they play the drums at the morning of New Year's day. ... was built in 1608 by Tokugawa Ieyasu.